Welcome back to the One Room Challenge, we are at the end… week 6!!! Hard to believe the challenge is over. I’m pretty excited I made it, not that I didn’t think I wasn’t going to but this last week was crazy. I would like to thank Linda from Calling it Home for putting on this challenge. It was very motivating and I’m sure that if it weren’t for the ORC I would have had the same bedroom for at least another 3 – 6 months. I still had my IKEA bed frame from university and not much else was going on in the room. The room was lifeless and definitely wasn’t relaxing. Lets see another before and after… I love this, especially when it’s my own room! My mom bought me a set of furniture for my room when I was little. When I moved out, I took some of the pieces with me and painted them. For the ORC all I had to do was change the hardware. The chair is from a church bazaar, my mom got it for $10! I had it recovered with the same fabric as one of the pillows. I found this beautiful chandelier on kijiji for $50!! I love it. My friend picked up the vintage lamps on Queen West in Toronto, they fit perfectly!! Thank you, Michelle! Matt and I made the headboard. It wasn’t too hard but I was scared to try anything other than a straight border, especially because I chose stripes for the fabric. 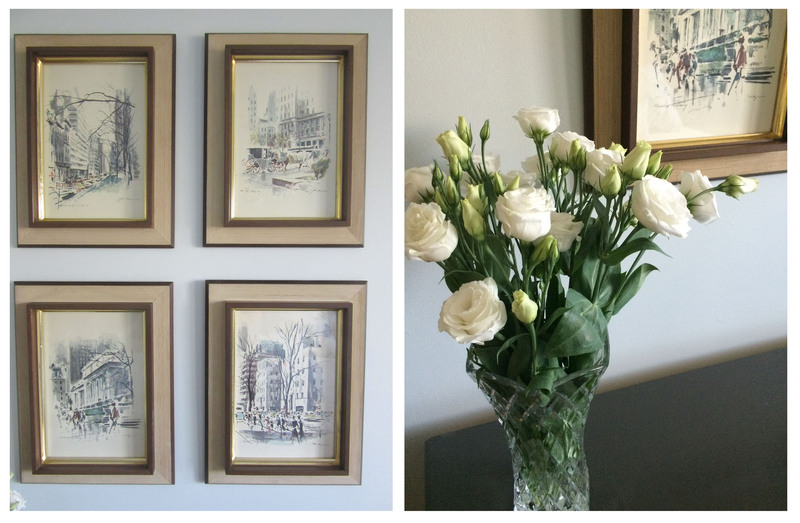 I love my Minted art pieces above the side tables, they definitely add to the feel of the room. I made this yellow rose arrangement for my grandma when I was a little girl and she kept it in her cabinet along with her Royal Doulton figurines. I have it now because she passed away almost 2 years ago… there isn’t a day that goes by that I don’t think of her. The little Eiffel Tower is from our trip to Paris 2 years ago! I want to thank all of my friends, coworkers, and family who supported me and helped me throughout this challenge. Especially to my loving husband for hanging pictures at midnight and making the headboard with me. Thank you to my mom for making the bed skirt and for all of your help. Hope you enjoyed following along, and who knows… maybe I will try it again next year! Be sure to check out Calling it Home to see the final reveals of the other 150+ bloggers who also took on this challenge and the group of 20 bloggers/designers that led the way each week! Looks great! The lamps fit in very nicely! Thanks! All thanks to you!! It looks incredible! Good job! What a beautiful and peaceful room Laura! I love the DIY headboard and the personal touches, like the yellow flower arrangement. Hope you enjoy a serene night’s sleep in your new room. Congratulations! Thank you Jennifer!! So glad you loved the headboard. We did enjoy a very restful sleep, in between Nathan waking up! Hope you are doing well. So very proud of you Laura! I love your choice of fabrics and the lamps are Gorgeous (capital G)!! Well done! So glad you loved the fabrics and lamps! Definitely my favourite parts of the room. Love it all. What a fabulous transformation. Love that headboard and love the new dresser and desk area. Beautiful transformation. I love the picture frames and bedding. I also have a similar flower(globe) in memory of my grandma. That’s sweet :-). Aw Ya it’s so nice to have something to remind you of someone special. Thanks! Thanks so much! The new desk area is definitely a bonus! So fresh and serene…well done!! Thanks for all of your interest Lori! I love that style of chair. The pops of wood between the chair and the nightstands are really speaking to me. I looooove that chandelier too. The glass arms are beautiful. Pleated drapes and chair upholstery by Cynthia Nadine at And Sew it Begins… Looking great! Beautiful job! Those textiles are simply, lovely genius!! And the chandelier… Oh goodness. And I love how you addressed that long bank of windows. I can’t pick a favorite! Beautiful job with the bedroom. It looks so calm and inviting. You have a lovely room! I like all of your choices but I especially like the lamps on the nightstand (what a great friend with good taste!) and the artwork over your dresser. $50.00 for the chandelier? Unbelievable. Relaxing and beautiful. What a wonderful job. I love the stripes on the headboard. You made a wonderful transformation. Great job. Love the serene feel and the simple beauty of your room!!!! Wonderful job! Such a great transformation….you did a beautiful job pulling this space together:) Love the soft colors! Just catching up on all the ORC reveals – yours if fantastic Laura! Great job. Love the chandelier and the headboard.